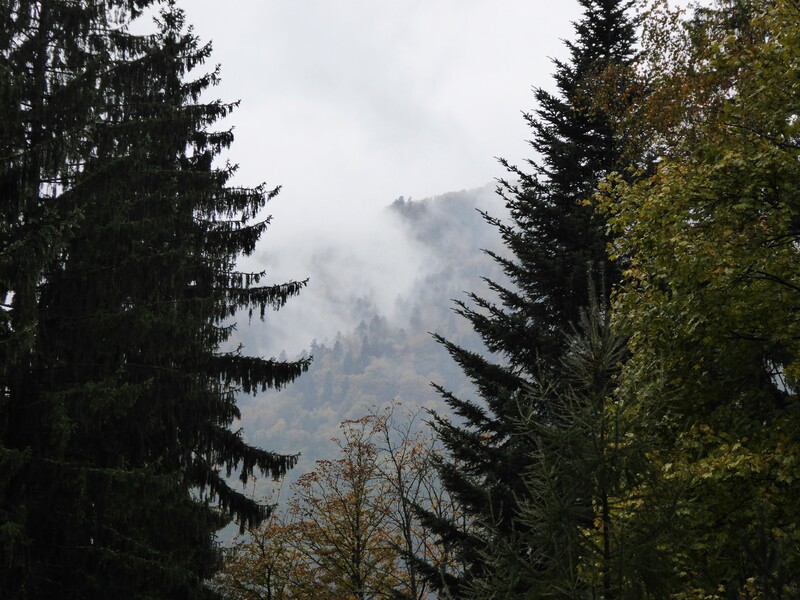 I followed the trail up through a pine forest towards a peak and it began to snow. The snow was so heavy that I was forced to beat a retreat. Battling wind and cold rain, I came to the outskirts of a village. 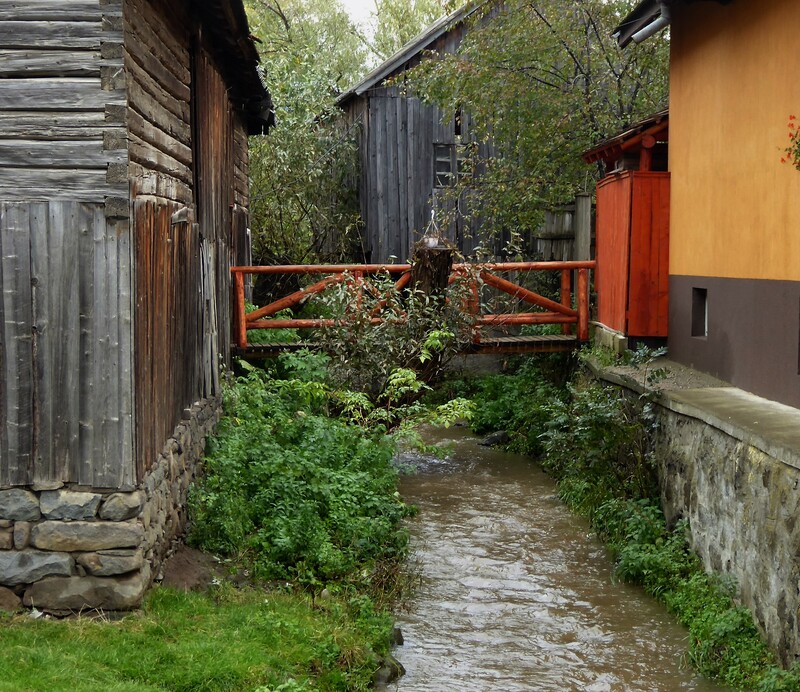 On an unsealed road, wet and muddy, I saw water flooding down channels between the houses; the sound filled the air and voices seemed to come from nowhere. Rounding a bend, I passed a small shop. Opposite was a blunt looking concrete hall, communist- era heritage. The door was open and the air filled with the sound of men singing. I peered through a window and saw 20, 30 men sitting either side of a long wooden table, tankards of beer in front of them. They seemed to know the words and tune to the song by heart – they sang in near perfect harmony. A little later, I was brought to a halt by another kind of singing: a loud clacking and honking. Spanning the road was a large flock of geese. 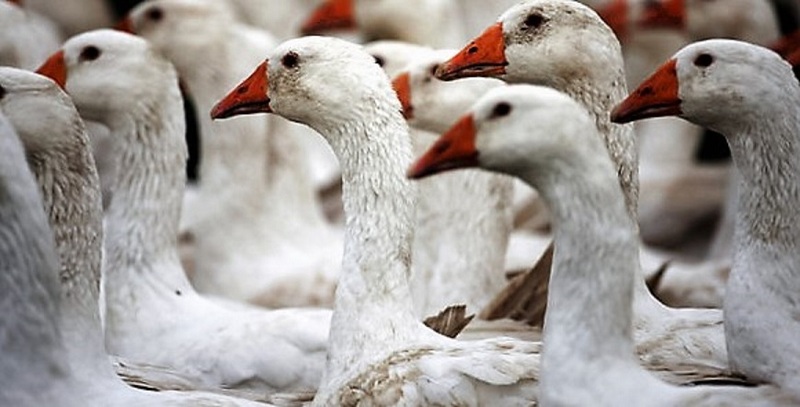 They were white geese, with orange beaks. They looked elegant in the grey and the rain. There was no one around. 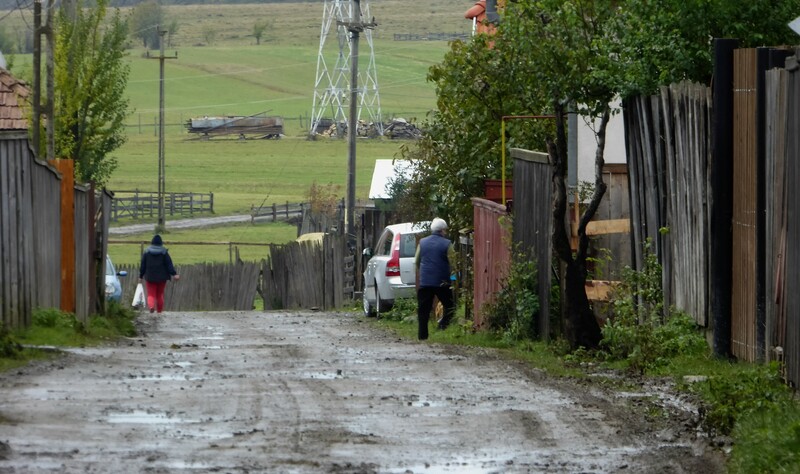 No one seemed to be leading them or herding them (herders are a common sight in Romania). But they must have been domesticated geese. Wild geese would never choose a village backstreet to land in. Had these geese escaped from their compound? Irresistibly lured outside by the rain and the sound of the swelling waters in the nearby creeks? I stood there and watched them, engulfed in their music. They stayed where they were, in no mood to go anywhere. Inside the Basilica of Annunciation in Nazareth, it was quiet, especially considering that there were at least a hundred tourists present. The tourists came from many countries including the U.S., Germany, Poland, China and Japan. They all had one thing in common: they were Christians travelling in an organised biblical group. There is a lot of this kind of tourism in Israel. The route that the biblical tourists follow takes them to Jerusalem, Bethlehem, Nazareth and the Sea of Galilee. The Basilica of Annunciation was built between 1960 and ’69, with funds provided by the Catholic Church; it’s a modern construction. The basilica isn’t actually a true basilica – like the traditional half spherical domes one sees in old churches. Rather it’s an immense cone, at the top of which is a lantern shaped skylight. I sat on the bench seats amongst the pilgrims and took in my surroundings. For me the church was a fine example of modern architecture. For the believers, it was a sacred place. I was impressed with how quiet the believers were. Hardly a whisper could be heard. The basilica was built on the place where according to the believers Mary was told by the angel Gabriel she would conceive the son of God. 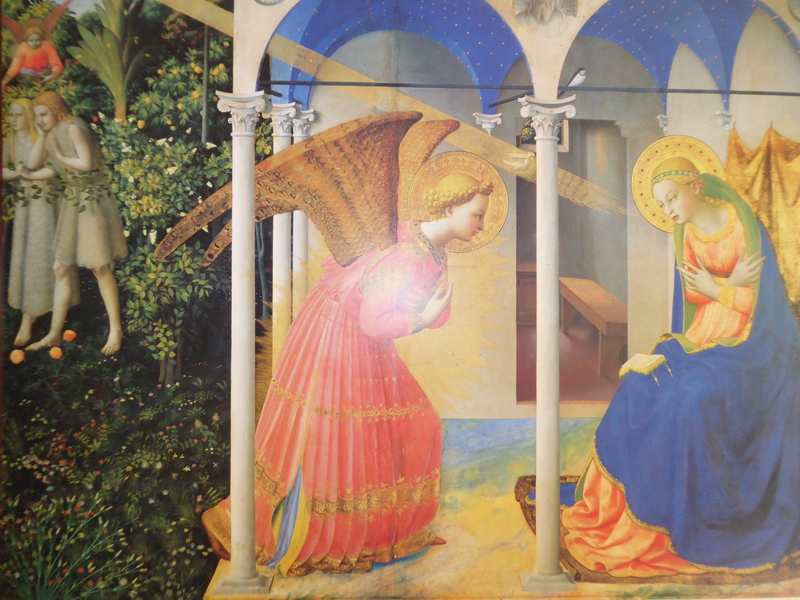 This was referred to as the ‘annunciation’. As an atheist, it was difficult for me to give a story like this much credence. But it did set me thinking about the angel named Gabriel. I had a framed poster of a painting featuring Gabriel. I had purchased it years ago during a visit to the Prado in Madrid. It was a perfect souvenir for a tourist. At the end of my visit to the Prado I asked the people at the information counter if I could have a copy of that poster – they gave me two copies and one of them was sent to Australia where it was framed and hung on the dining room wall of a small suburban house on the south coast of Adelaide. ‘La Anunciacion’: a taste of classical Europe in the antipodes. I thought about it whilst sitting in that fine basilica in Nazareth. Gabriel was kneeling before Mary. He had short golden hair and was wearing a long pleated robe. His wings, too short to ever lift such a richly clad figure, were brown grey. Mary, very much a medieval mother, had her head bowed. A beam of golden light, shining from behind Gabriel was shining on her face. The copy of the original painting was very high quality and it was a beautiful painting, a work of art which could even stir the heart of a sceptic like me. When I looked at it, I felt an almost mystical appreciation for the idea of God and for the way in which this idea had inspired great artists to attain sublime heights. With the medieval image of Gabriel before me, I remembered that I had read about him recently in a book by the British historian Tom Holland called ‘In the Shadow of the Sword.’ Holland was one of my favourite historians (along with Simon Schama and Niall Ferguson). There was something I had read about Gabriel which was important, but I couldn’t remember what it was exactly. Gabriel…what was it again about Gabriel? About a hundred meters away from the Basilica of Annunciation was a mosque. The mosque was on an open square in the centre of old Nazareth. It was the first thing I saw on arriving in Nazareth and getting down from the bus. The mosque was a small one and there were no minarets. The imam in charge was a hardliner. My LP guide reported that a year earlier, he had allowed some of his parishioners to cover the square in anti-Christian slogans written in Arabic. Earlier in the day – a Friday – I had noticed that there was something going on at the mosque. Men had appeared from inside the mosque carrying rolled up carpets. These they unrolled over the square, one after the other, like something out of the Arabian Nights, until most of the square was covered in deep red carpet. A small table was placed in front of the carpets and a large flat screen TV on the table. Loudspeakers were connected to the TV. There were cables everywhere. The whole operation took about an hour. On the TV screen came an image, a still photo, of the great mosque in Mecca. It stayed there. Nothing much happened. Something was going to be broadcast and I wanted to see what, but I got impatient. That’s when I head to the Basilica just up the road. 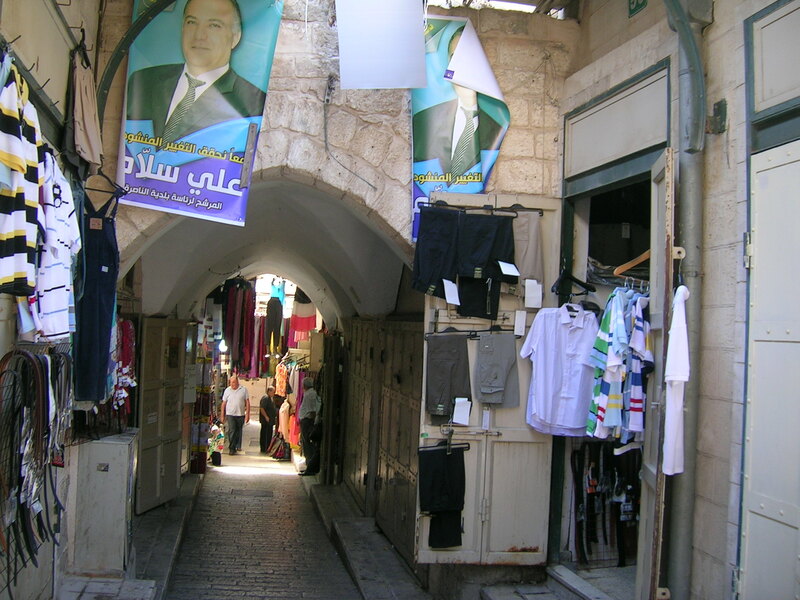 Up until comparatively recently, Nazareth was a Christian town. For centuries it was a popular destination for Christian pilgrims from all over Europe – an ancient version of the biblical tourists who appear today. It was not only where Mary conceived Jesus but also where Jesus grew up and learned his trade as a carpenter. Even today amongst the maze of narrow alleyways of old Nazareth, there are old stone work buildings which were originally hostels built to accommodate the constant stream of pilgrims. Some of the Christian pilgrims who came to the Holy Land were highly unsavoury types: the Crusaders for example. On their way across Europe, the Knights of Christ indulged in the time-honoured sport of Jew-killing. Whole communities of Jews were wiped out in Southern Germany and Eastern Europe. Leaving a trail of blood behind them, the Knights arrived at their destination and then proceeded to massacre Moslems – and also, more Jews. Today Nazareth is a Moslem city. Roughly 70% of its inhabitants are Moslem Arabs, 25% Christians and 5% Jews. In the last decades, the demographic effect of high Moslem birth rates has put an end to the Christian heritage. I left the Basilica and went out a side door where there was a long ‘L’ shaped wall shaded by a canopy. Here there were also throngs of biblical tourists. Along the wall were 30 large panels – mosaics and painted relief works – representing the theme of Mary and her baby Jesus. Each panel was made by Catholics hailing from various countries from all over the world. The images were very different from one another and each one, very beautiful in its own way. 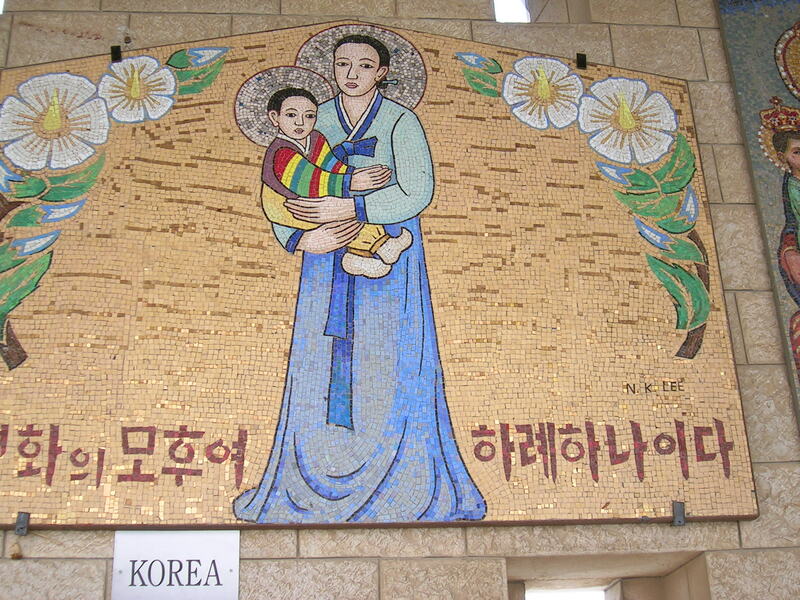 From all the images of Mary and Jesus, I really liked the one from Korea. At some point whilst I was admiring the images of Mary and Jesus, a loud high-pitched screaming began. Putting two and two together, I realised it must have been an imam on the TV in the square who was delivering a sermon. He screamed and ranted and yelled. It was an unpleasant sound and it was so loud. The TV imam was apparently pretty wound up about something. Even deep inside the Basilica I could hear the TV imam. That was the point of course. To make sure the TV imam was amplified so loud that even in the deepest precincts of the church Silence had no chance. The old and familiar theme: intolerance. I arrived there to see about 50 men seated on the carpets. On the TV was an old man with a turban and a long white wispy beard. He could have been an ascetic. I was really surprised. It was incredible that such an old man could find the energy to keep up such a burning rage. How could his vocal chords withstand such sustained screaming? He just went on and on. I wondered where the broadcast was coming from: Saudi Arabia? 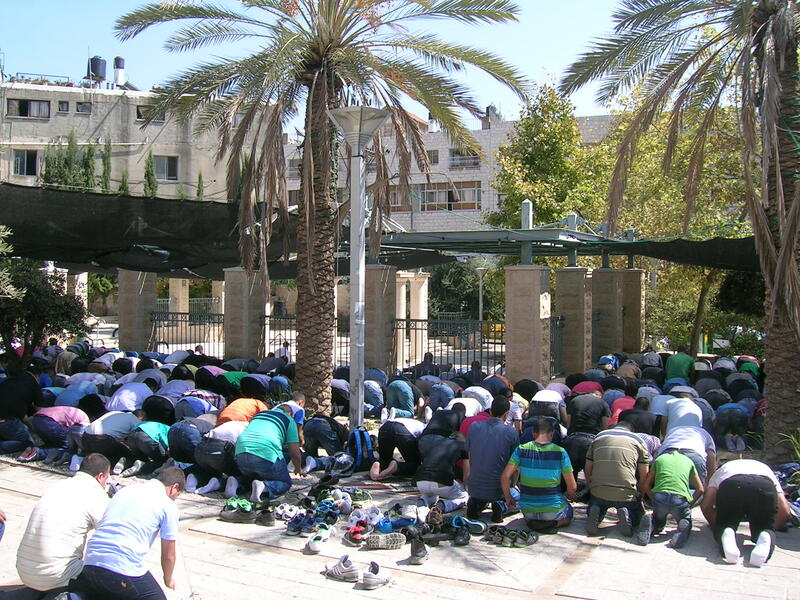 A mosque somewhere beyond the borders of Israel? I was hungry and went into a nearby café. The café was large by crammed side street standards. It went back some way from the narrow front. There were tables and chairs. On the walls there were old photos of Nazareth when it was a village and some pieces of embroidered cloth. The café reminded me of a place somewhere in Cairo and I’m not sure why; there was a feeling of oldness covered over in a veneer of freshly painted walls and a newly installed counter. I don’t think that the screaming imam would have approved of the Moslem family who ran the café. The mother and daughter had short hair and were not wearing headscarves. The café sold wine – Israeli wine – which I believe the father and his mates, who were sitting at one of the tables, were enjoying to a perhaps somewhat excessive extent. They were doing a lot of laughing. The teenage son who served me found it difficult to drag himself away from The Call of Duty. I ordered hummus, salad and pita bread – and a glass of wine. The hummus in Israel is the best in the world. It’s another thing entirely to the muck which is sold in the supermarkets in the West. Everyone in this country, in spite of their differences in religion or race, is addicted to the hummus and it’s easy to see why. And I have to say, the Israeli wine I drank seemed pretty reasonable. If it hadn’t been made in Israel, it could have been sold anywhere in the world. My meal finished I walked outside. On the way back through the maze of ancient alleyways to my hotel I passed lots of little stalls. There were posters everywhere for candidates competing in the local elections. Of course I didn’t know what the issues were but that didn’t stop me from forming an opinion about who I wanted to win: the only woman candidate. She had short hair, no headscarf and big plastic glasses. She was a better bet for getting the Moslems somewhere positive than the likes of the wispy bearded TV imam. I got lost in the Byzantine maze of back alleys. The problem was: I wasn’t concentrating on where I was going. I was thinking about the angel Gabriel. After I finally found my hotel, I got out the book by Holland and checked the index in the back for ‘Gabriel’…..
Gabriel was a popular angel. Not only did he convey the news to Mary that she was going to conceive the son of God, but the very same angel turned up 600 years later in a cave outside Mecca in Arabia. There he materialised before a middle-aged merchant who had fallen asleep in a cave. His name was Mohammed. Gabriel had a message for Mohammed which came straight from God (the Arabic word for God being ‘Allah’). It was a long message. Two centuries later it was written up as a book called the Koran. Gabriel….but the very same angel had appeared before the ancient priests of Judaism at least 200 years before the birth of Christ and 800 years before Mohammed. The angel Gabriel was a Jewish angel. Which underlined something else: both Islam and Christianity evolved out of Judaism – the first monotheistic religion in the history of the human race. Now considering this, one would have thought that the followers of these three religions might have been able to live in peace, appreciate the things they had in common. On the contrary – for centuries they had waged war on one another. A Jewish angel had sown the seeds for two religions which each in its own way had done its best to destroy the Jews. You can write many stories about the human race, an infinite number of books both fiction and non-fiction, but never will you reach anything like an end to the mystery of what it is to be us. Three ancient adversaries, a long and bitter history behind them, forced into an uneasy coexistence in the same small country called Israel. Whether the world’s best hummus was going to be enough to keep the peace was a debatable issue. My flight into Mumbai was delayed by two hours in Singapore. Arriving at Mumbai airport after midnight, my plane had to bank for twenty minutes before it could land. In the airport, there was a breakdown at the baggage belt. It was 3 am when I got through customs. 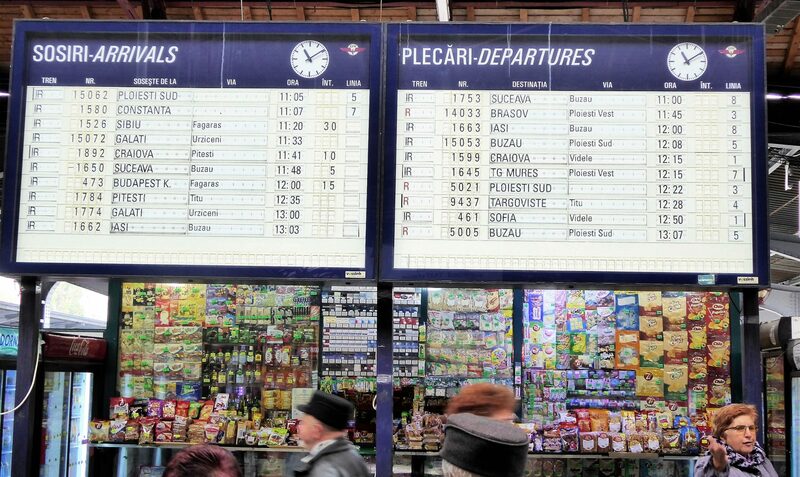 I bought a ticket for a prepaid taxi. Emerging from the airport, passed hundreds of people, I found myself alone staring into the warm night holding a piece of paper which I’d paid four hundred rupees for. In the distance, under the dark silhouettes of trees were rows of dilapidated, beaten up taxis. There must have been fifty of them. I walked over there and looked for the number plate of the taxi on my piece of paper. Finally found it and after the driver ostentatiously welcomed me and put by bag in the boot, he couldn’t start the car and I had to get out and with some other taxi drivers, help push start it. On the way into Mumbai, the driver had to stop to get more fuel. Why he didn’t have enough petrol in the first place was something I would have liked to ask him if he had spoken more than a few words English and I, more than a few words of Hindi. We pulled into a ramshackle looking place with a few beaten up looking petrol pumps covered in dust. Nearby, cows peered at us dolefully. The driver turned off the motor before getting out of the car and so of course, after he had put more petrol in the car, I had to get out whilst he got in – and push and push to get the car running again. It was 4 am in the morning and I had a long flight behind me and I was not amused. Arriving in Colaba, we drove down narrow streets lined with old apartment buildings. He lost his way. 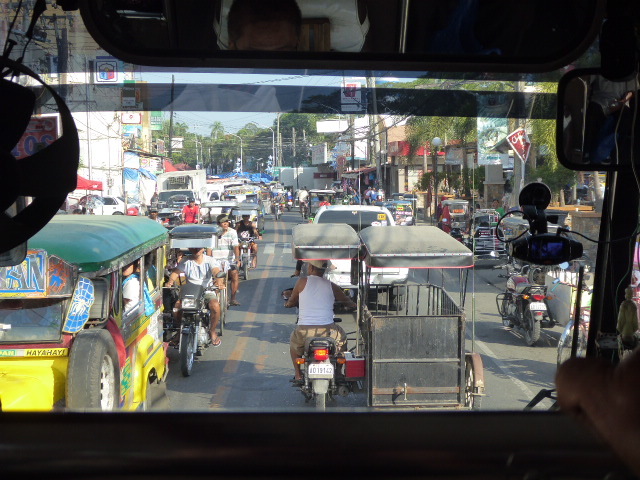 I was having to push start his taxi because he didn’t know where to go…huh? At 5 am, I finally arrived at my hotel, very jaded and very tired. On the pavement stood a young man whose job it was to stand there all night watching everyone who came and went in and out of the hotel. He was a kind of human alarm system. My first reaction was to be very short and direct with him. But he spoke good English and he was very nice. He was from Orissa, one of the poorest states in India. Like so many others, he had come to Mumbai to find work. Every night, from 8 pm to 8am, he stood on the pavement. He shared a room with nine other young men. He said it was ok, five of them worked at night, five during the day, so the room was never too crowded. He had no education, but within five months of arriving in Mumbai and meeting westerners he had learned enough English to hold an extended conversation. He asked me the normal Indian questions – how old I was, whether I was married, how many kids I had and so on. He was amazed to discover that I had no caste, wasn’t married and had no kids (‘don’t you like children? who will look after you when you get old?’). After talking to him for quite some time, I went inside the hotel. After filling out some forms – ‘some forms?’, one hell of a lot of forms – I climbed narrow flights of stairs up to my room on the fourth floor, had a shower and passed out…..
Two hours afterwards I was wrenched out of a much-needed sleep by two sounds which I hate and hate passionately: drums and bagpipes! If there is a Divine Being and He or She punishes me for not believing in Him or Her, it will not be in a place filled with burning sulphur but rather, in a place where the banging of drums and the shrill whining of bagpipes will resound forever and ever…. I was not a happy man. I was in a mood to kill someone. I couldn’t see anything. To the left of my window there was a dingy apartment building with rows of barred windows and on the flat roof, a bevy of crows dancing around. Marching along the road were young Indian men dressed as Scotsmen with knee-high white socks, yellow kilts, blood-red shirts and yes, some were blowing bagpipes and others, bashing drums. My anger evaporated. I couldn’t quite believe what I was seeing. After the Scotsmen came groups of school kids, immaculately turned out in their uniforms: blue trousers and dresses and white shirts. After them came an elephant with a huge banner draped over its side. The banner was green and edged with sparkling tinsel. Where else in the world could you possibly get a vegetarian pageant?